Essentials you need as a part of your wardrobe. With summer in full swing and I could not find a better time than now to share some of my faves by PacSun Denim that are all budget friendly and are perfect to wear all year long. Online shopping can sometimes get overwhelming so I will link my entire look I am wearing at the bottom of the post along with some of my other faves I found for you ladies to shop. But, before we get into the shopping let’s talk about the four pieces you need for your wardrobe to make a statement on it’s own. 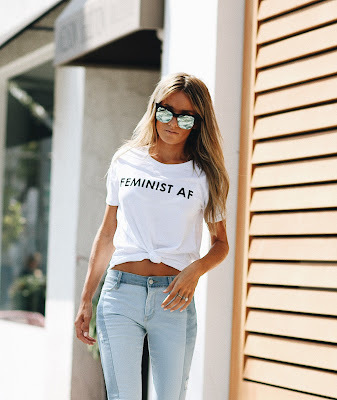 Not-so-basic tee. 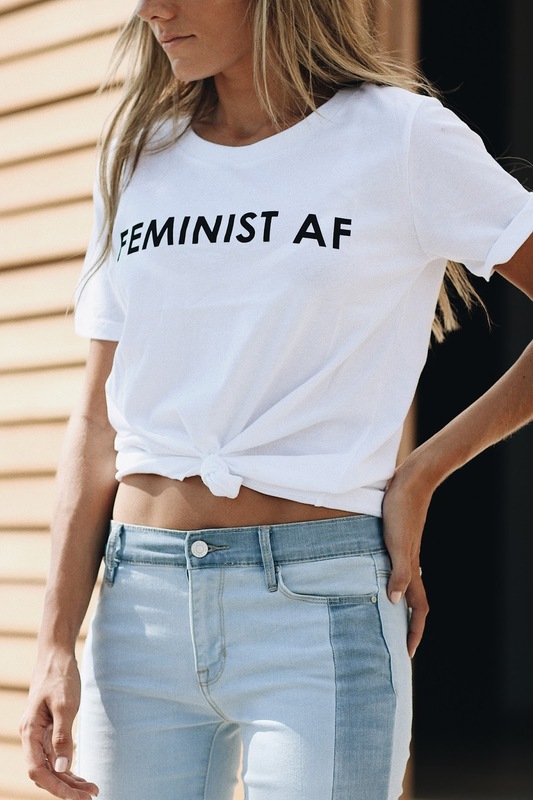 If you have been following me for a while you know that I am a huge fan of a good statement tee, if it comes in any basic color & has some cool wording or embroidery on it - I’m adding it to the cart. 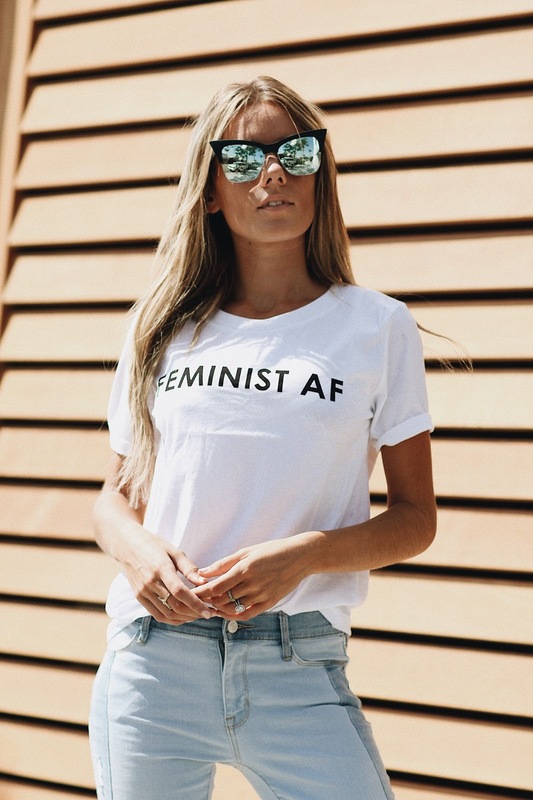 It’s one of those pieces that speaks on itself and when I spotted this tee “FEMINIST AF” on PacSun website I had to have it! Ladies, let’s all get on this feminist wagon and support one another because as they say “teamwork makes the dream work”. [I am wearing a size Small, but sort of wish I west a size up for a more oversized, casual look]. Fun pair of denim. I’m very picky when it comes to denim pieces, not only because of the fit but of the look as well. I often find it harder to find a pair of jeans than a pair of shoes. If you’re like me you will looove this pair as it comes in sort of a multi-color look with a lighter and a darker shade of denim that you can literally pair up with anything. It’s also super easy to dress it up or dress it down. I paired it up with this casual tee and sneakers but you could quickly throw over a denim jacket, black heels and you’re ready for a night out. [Jeans are true to size, I got sz 24 & it fits like a glove, it also is low waist which I absolutely love]. Statement sunnies. Say hello to my 30th pair of Quay sunnies haha. Thanks to PacSun for making it sooo easy to put an entire outfit together just by clicking through different categories. Check out their entire accessories collection, they’ve got plenty of goodies to finish your look. 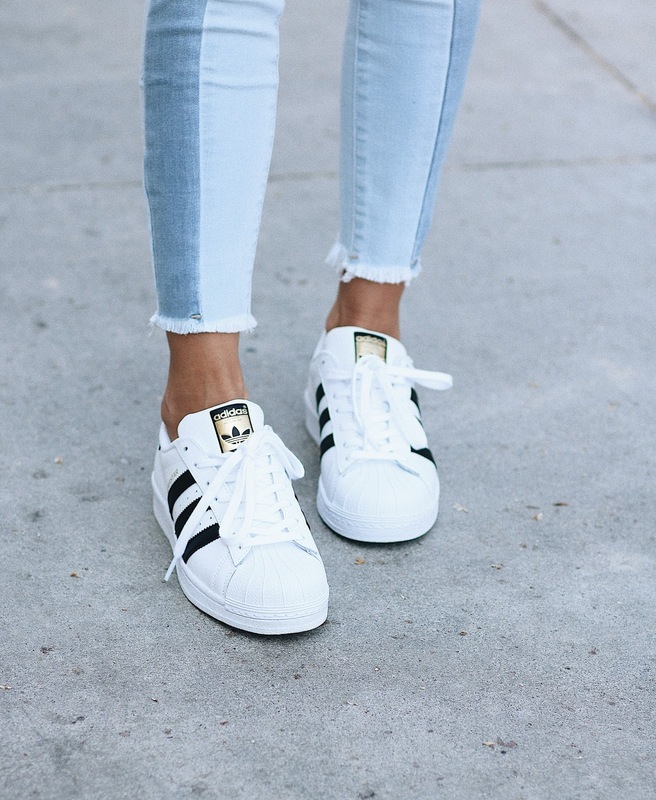 Fashion sneakers. Yay! I am now a proud owner of these Addidas kicks! I am sure you’ve seen them everywhere by now but I have been eyeing this pair for a long time and have finally gave in and added it to my closet as well so you’ll be seeing them quite a lot. The only reason I’ve been so sceptical and took so long to get this pair is because I have been hearing that they tend to run a size big, however I was pleasantly surprised after I chose 8.5 and it fit perfectly. I am guessing it depends on the shoe? PacSun does have reviews left by customers under the products so you can easily figure out what would fit you the best. Thank you PacSun for partnering with me on this post.